Good news for those who petitioned for the return of Miss Fisher’s Murder Mysteries with the third series set to unroll on ABC next month. Due to replace Midsomer Murders from May 8th, guests this season include Grant Piro, Kate Mulvany, Robert Mammone, Rodger Corser, Dan Spielman, Diana Glenn, Philip Quast, Damon Gameau, Arianwen Parkes Lockwood, Colin Moody, Nell Feeney, Michala Banas, Jeremy Lindsay Taylor and Ella Scott Lynch. of household cohorts and continues her playful partnership with the suave and dedicated, Detective Jack Robinson. Phryne’s estranged father, Baron Henry George Fisher, arrives unannounced in Australia after selling up the family estate in England and does his best to ingratiate himself with Dot, Bert, Cec and Mr Butler, though his roguish charm is lost on his own daughter. When Phryne recalls a secret encounter she witnessed during the War, between her father and an angry visitor, she begins to suspect that the cousin the Fishers inherited their title from is still alive and could be out to exact his revenge. 8:30pm Friday May 8 ABC. I would also love to see me spell Phryne correctly! I would love to see Phryrne cross paths with the Babadook. Another ABC show which is produced in full HD for the UK but we see only a SD version !! They inncur the extra costs of producing an image for Blu Ray discs,costumes,scenary, but even though we taxpayers pay for it they give us locals a low quality transmission. Please explain ? If it needs to be explained again, it’s the govt’s fault for not repealing legislation that forces the “main” channel of each network to be in SD. That does not apply to the ABC , they can similcast or run repeats on ABC 24 . It does apply to ABC but they could put whatever they want on 24, just the same as the commercial networks can with their HD channels (but often don’t). However, ABC24 is a dedicated news/current affairs channel so it’s unlikely to show drama repeats. Great. And good to see ABC is sticking with something they do well…rather than the God awful Hiding and pretentious Time Of Our Lives. 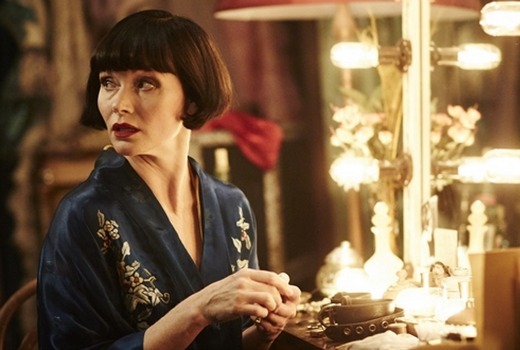 Go Miss Fisher!